Remodeling projects can be challenging, but choosing an entry door for your home doesn't have to be difficult thanks to the skilled team at Murphy Home Improvement. Serving Cincinnati, OH, for over 30 years, the company specializes in the installation of doors, gutters, siding, roofing, storm products, and windows. Selecting a front door begins with assessing your overall design and functional needs. 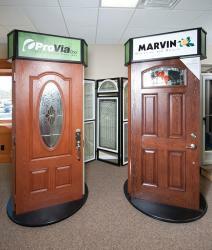 Here are a few factors to consider as you begin shopping the many types of doors available. Materials: Entry doors are made with numerous materials, including fiberglass, metal, steel, and wood. Consider how they may respond to certain weather patterns; if you live in an area that's constantly sunny, a steel door that grows hot to the touch may not be the best choice. Conversely, a solid wood door may prove more durable. Ultimately it's best to seek out a door that provides the greatest energy efficiency. Upkeep: Considering door maintenance before a purchase is another reason that material is such an important factor; some, like fiberglass, require very little upkeep and are quite long-lasting, while others, such as wood, may need to be refinished over time or if they suffer weather-related decay. Cost: As with most household enhancements, an entry door is an investment. Consider the amount you want to contribute to this element of your home. A complete wooden door system, which includes a door, hinges, weatherstripping, and other elements, can prove more costly than a fiberglass door option. Appearance: While it's important to look beyond the aesthetic factor, a good-looking door is also an important quality. Many doors can be stained to complement your home's exterior. Some feature glass paneling or accents that offer a stately look, while others are basic and traditional. With so many styles on display at the Murphy Home Improvement showroom, you'll find it easy to select one based on looks alone. Entry door installation requires a level of expertise, high quality service, and impeccable workmanship that the professionals at Murphy Home Improvement strive to deliver. Bring your door or window measurements when you visit the showroom and you'll even receive a 10% discount on your door or window purchase. If you're interested in upgrading your entry door or want to learn more about the process, visit the company's website or call (513) 922-8989.